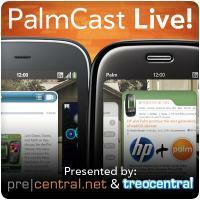 PalmCast Live goes live tonight at 8pm Eastern, just like you were hoping. Tonight Dieter and Derek will be joined by two special guests: Jason Robitaille on the audio line and Phil Nickinson of Android Central sitting in Dieter's office, heckling the lot of us in the background. We'll talk up the week's worth of news and maybe take a short look at some of the Android competition that's been cropping up like dandelions in the past month. Tweet questions to us with the #palmcast hashtag for the lightning round. If you're curious how a specific Android device compares, let us know that.